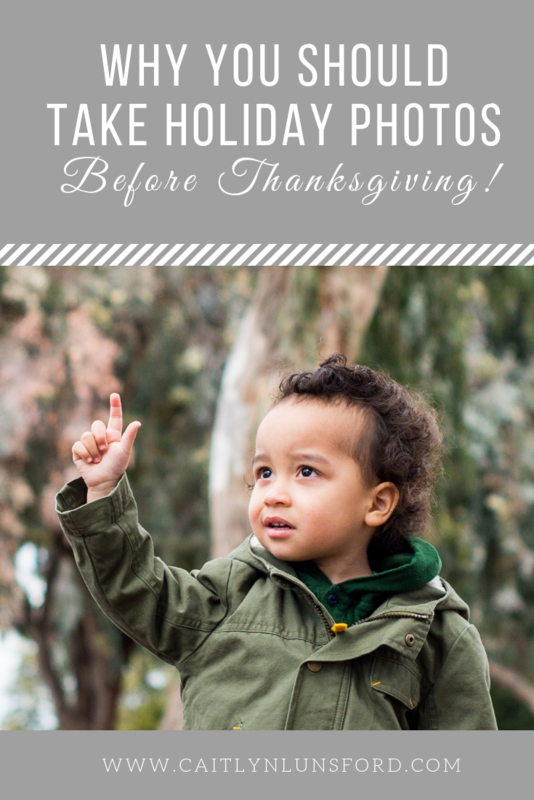 Have you ever wondered when you should schedule the photo session for your family’s annual holiday photos? In the past, you have probably waited until December and then you felt rushed, stressed and disappointed. 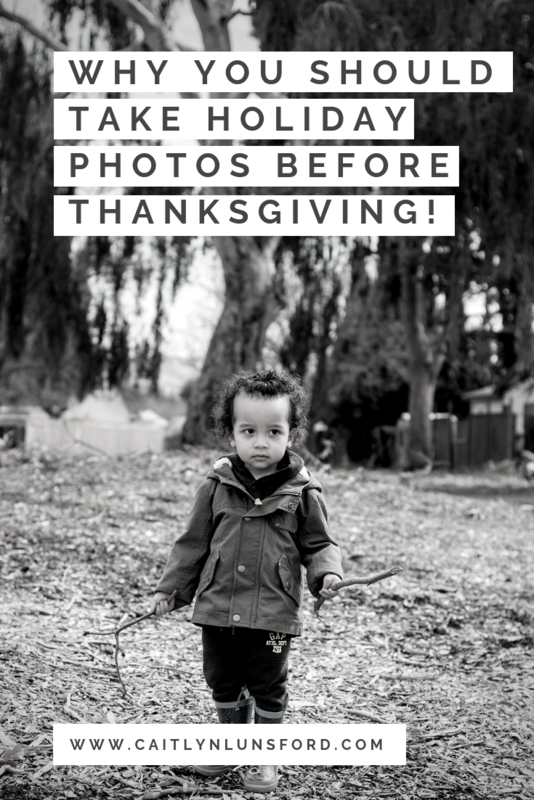 I recommend scheduling your holiday photo session RIGHT NOW and take the photos before Thanksgiving! I know, I know. The holidays are the last thing you want to think about right now. The kids just went back to school and fall has barely begun! The days are getting shorter and it seems as if they are all running together. The holidays seem like they are so far away and you don’t want to have to deal with that stress right now. I’m sorry to burst your bubble, but there is not as much time as you might think! There are less than 100 days left until Christmas after all! I’m not saying you have to start shopping and decorating today, but I do encourage you to start planning your photo session a little early this year that way you aren’t faced with extra stress later on in the year! The pressure for everything to be perfect during the holiday season sets in right around Thanksgiving. You will need to cook dinners for your extended family, plan holiday parties, buy really good gifts and all that other holiday stuff. 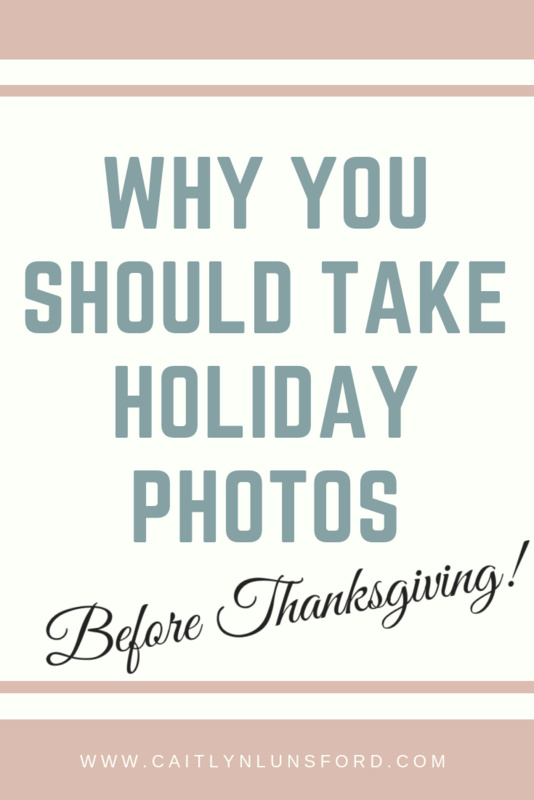 What if I told you that holiday photos didn't have to be taken during the holidays? 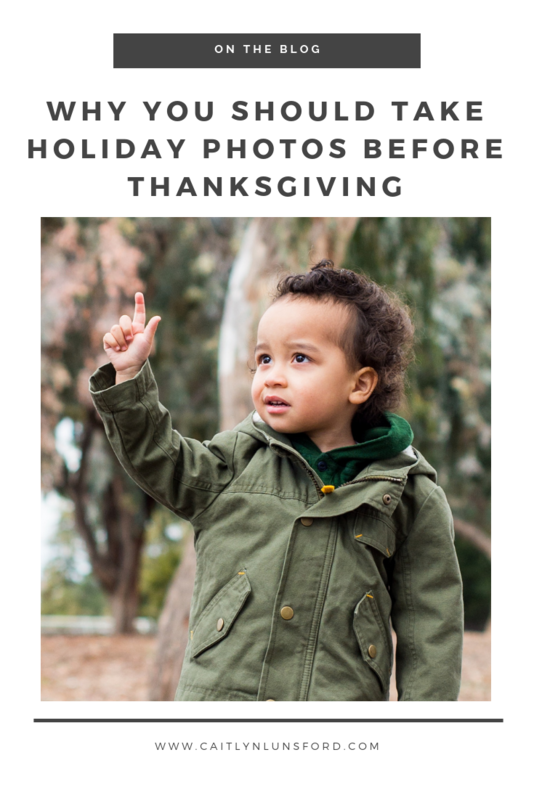 If we take them before Thanksgiving, you would still get the holiday aesthetic, but the actual photos would be taken off your plate, way before the Turkey! Where will you take the photos? What if my kid doesn’t cooperate? These are all really important questions, and I will help you answer all of them, but right now, all you need to do is pick a date to put on the calendar. It may seem too early to start planning for your photo session, but the end of the year is not only the photography industry’s busiest season but yours as well. You have probably heard a photographer say, "Well, you can purchase the digital copies and print them yourselves!" You took that advice and found yourself with even more added to your mile long to-do list! Printing the photos is my job and the last thing I want to do is to give you more work! All you will need to do is choose your favorite photos and how you want to print them and I will take care of the rest! If you plan on using the photos for holiday cards, then you are probably expecting to send those out at the beginning of December. With the turnaround time for holiday cards, the photos would need to be taken before Thanksgiving to have the cards back with plenty of time to address, stamp and mail off your envelopes. During your ordering session, you could also choose to purchase some of the photos as gifts and get those taken care of as well! A photo album makes a great gift for grandma. She is going to love flipping through the pages filled with her darling grandchildren! Another really good reason to schedule your photo session right now is the weather. We live in the Pacific Northwest, where it is famous for its rain and chances are, the photo session might get a little wet. If it does rain on the day of your photo session, we can always reschedule, but if we have Christmas as a deadline, then it might be too late! When you schedule your photo session to happen before Thanksgiving, we won’t have to worry about the rain nearly as much as if you waited until later. If you have been thinking about scheduling a photo session for your holiday pictures, now is the time. You might have some preconceived notion that your photos need to be taken in real time, that way they accurately represent what your children look like at that moment but unless you have a newborn, your child isn’t going to change all that much in a couple of months. Nobody is going to be upset with you if you choose to take your photos in October or early November. If they find out at all, they might even compliment you on how smart you are to get them done! 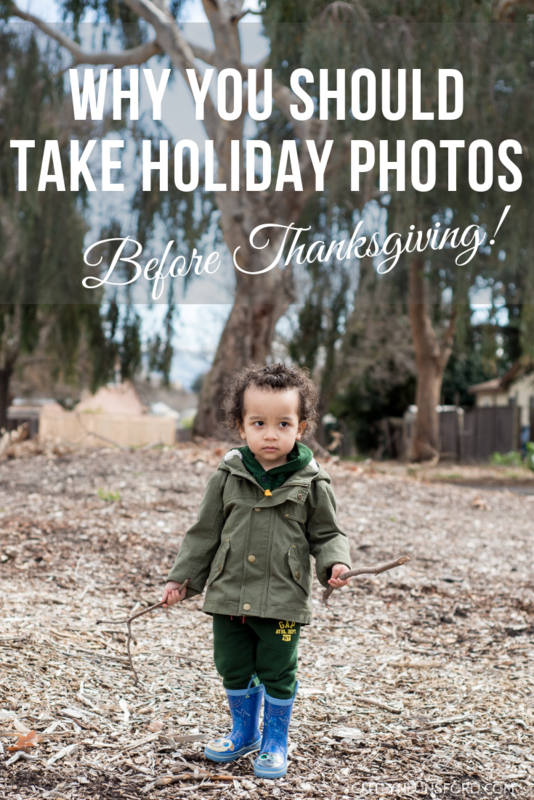 Are you ready to start planning your holiday photo session? Send an email to hello@caitlynlunsford.com or schedule a phone consultation for more information!